One of the most rewarding parts of creating a new product, especially an artistic one, is having the ability (and privilege) of sharing it with the world. 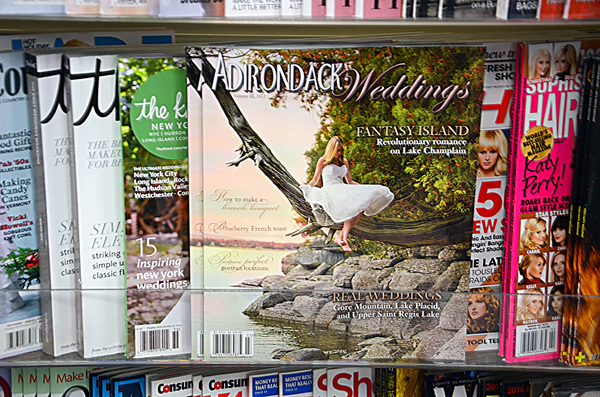 We are lucky to have a network of awesome newsstand distributors that get Adirondack Weddings into stores both near and far. 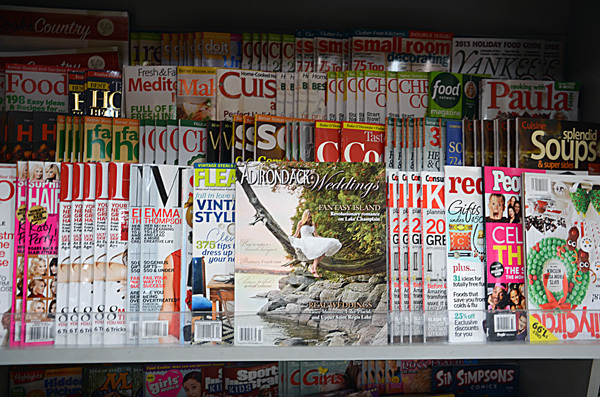 The magazine can be found on shelves in 13 states and Canada! Here’s just a partial list of store locations. Our retailers include Barnes & Noble, Rite Aid, Price Chopper, Hannaford, Kinney Drugs, Wegmans, Weis Markets, Big M, Mac’s, and so many more. 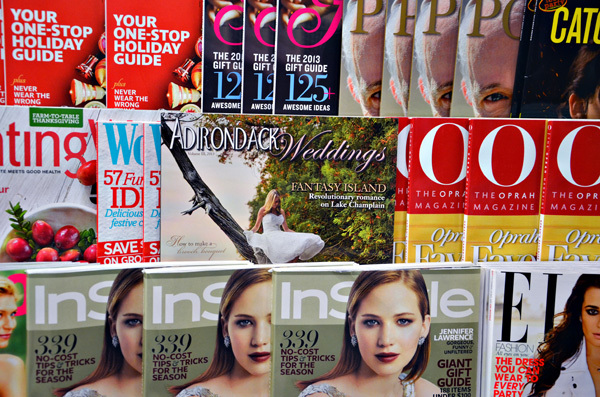 At most stores, copies of our annual magazine are continually replenished year-round. Cool, huh? On Friday, we decided to go on a “newsstand hunt” to check on our latest wave of copies sent to shelves. While we only checked in Plattsburgh, the results should be fairly representative of current availability, particularly at our chain locations throughout New York State. 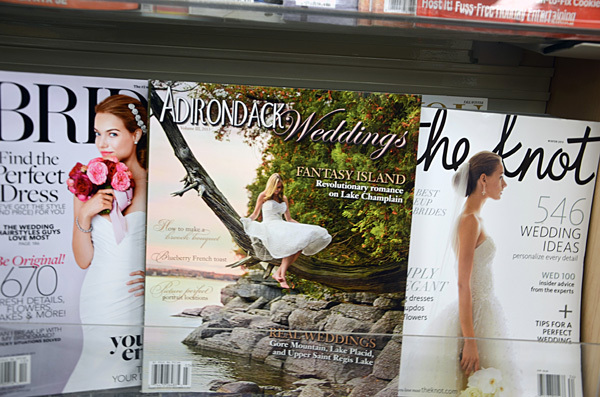 Above, the magazine is pictured at Yando’s Big M in Plattsburgh, which is located in the plaza off of US Avenue, near the old Air Force Base. 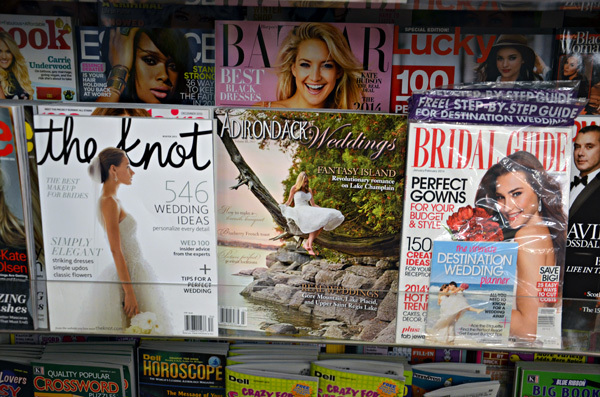 Above, the magazine is pictured at Hannaford. Big grocery store chains like Hannaford and Price Chopper tend to stock a TON of copies, so they are usually a good bet when you’re trying to score the latest issue. Above, the Shell station on Route 3/Cornelia Street, between the Wal-Mart plaza (Consumer Square) and Price Chopper plaza. This little store has a surprising number of different magazines! Good luck in your newsstand hunting, and feel free to share any spottings of your own! The first time I ever stumbled upon Adirondack Weddings was in a Barnes and Noble before I moved to Plattsburgh. I love seeing issues when I’m out and about and knowing they’re about getting married in my area.